To most of us good fuel economy means we have more money left in our wallet after a visit to the gas pumps. Did you know it also means you have done a good thing for our environment? FYI – Fuel economy is gauged by the number of kilometers your vehicle will travel per liter of fuel. The steps in finding, making and burning gasoline all produce by-products that are considered harmful to the environment. The less fuel you use means less harm to the environment and while you and your vehicle might seem insignificant in the grand scheme of things, what YOU do DOES make a difference. Ironwood Auto Technicians in Campbell River is committed to helping you keep your vehicle environmentally friendly and running like a top! If you drive like 007 on a mission, constantly pushing the speed limits, screeching to a stop, burning rubber when the light turns green, then your driving is costing you money. If you leave your car idling when you could turn it off and blast your A/C system when you are going slow enough to open a window and enjoy some fresh air then you are also burning more gas than you need to. Good vehicle maintenance and decent driving habits will help reduce your “vehicle footprint” on our planet. 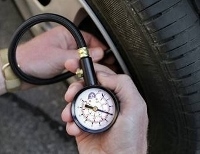 For instance, low tire pressure, a clogged air filter or fouled spark plugs can affect your fuel economy, costing you more money at the pumps and adding a little more carbon dioxide to the atmosphere. A couple of trips a year to your trusted service station for regular maintenance is not a luxury, these days it’s a necessity. Your technician will check your spark plugs, replace your fuel filter and air filter, check your cabin air filter, check your ignition and emission systems and ensure that your onboard computer control system is working properly. You can improve your gas mileage by 4% with a proper tune-up and up to 40% if a serious maintenance issue like a faulty oxygen sensor is identified and resolved. These numbers add up to money in your pocket and a little less pollution on earth. Sounds like a win/win proposition! Contact Ironwood Auto Technicians and make sure your vehicle is serving both you and the environment.